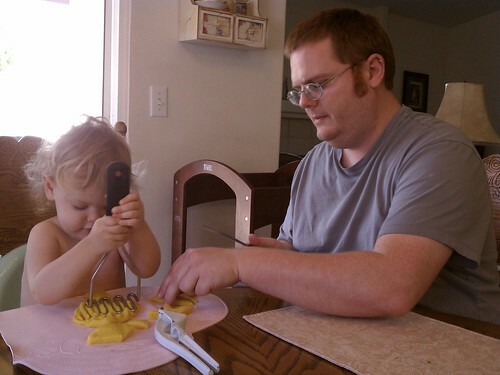 Playdough and my work history. TMI I’m sure. I have always loved babies. When I was dragged to church as a tween (even though that term didn’t exist then) and a teen, I hung out in the nursery with the babies and the ladies that worked there. I was just about everyone’s go-to babysitter and I just knew that my life was meant to include babies and that I wanted to work in daycare and preschools when I got older. I took child development college courses and worked at a number of preschools and daycares. Everything from a major corporate run preschool that was full of children who’s parents were doctors, lawyers and bank presidents, to a home daycare, to a couple of small independent preschools, and most of the kids sucked at each and every place. No manners, mean, disrespectful, etc. I guess some of them were just kids, but some of them were the devil incarnate and you can’t convince me otherwise. Anyway, after a few years (maybe as many as 7, but who’s counting, really) I realized that if I ever wanted to have my own kids I would have to find a different career path or I was going to hate kids so deep in my core that my eggs would shrivel up and I’d never get pregnant. So I went into credit unioning banking and loved it and when I was finally ready to get pregnant (like 6 years later) I got pregnant three months after we started trying (if you were wondering). 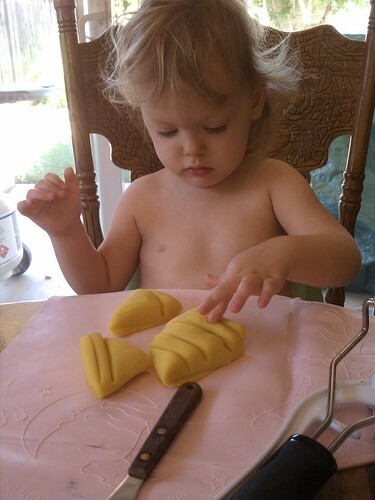 Playdough is one of our favorites and a go-to activity around here. Here’s my go to playdough recipe. I wish I remembered where I got this recipe from, sorry. I’m sure there are other great ones out there, but this is the best out of the three or so I’ve tried. I don’t keep normal food coloring around so Lily usually just plays with this in it’s natural beigh-ish glory. Also I’d been too scared of natural dyes, that they might stain our hands so I hadn’t tried any yet. This time when I got into the spice cabinet for the cream of tartar I noticed some turmeric and remembered that it could be used as a yellow dye. I added about 1 tsp to the warming water and it worked out great. The old white paint on the garlic press that Lil uses with the dough got a bit stained as did the cutting board I used to knead on, but those things will fade with time I’m sure. No yellow hands though so I was happy. I don't love playdough on clothes, can you tell? My sad little playdough guy. Let me know how it goes for you guys. 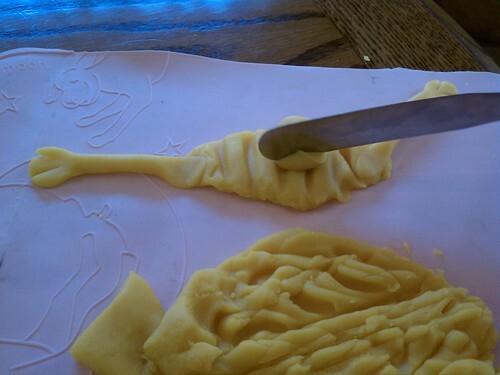 I’ve actually never made homemade play-doh. I bet my girls would love it!